All of our bespoke suits are hand cut, stitched and finished in our workshop in Napoli, Italy to a pattern made just for you from a unique set of measurements and anatomical notations we take when we meet you. We use only the best materials and seek to make classic garments with a strong dose of character and edge. Each reflects the client who is to wear it and will stand the test of time. After all it needs to ‘fit’ more than just a form. It needs to fit a purpose. Buttons: If not double breasted, Terry Corbett's suits feature two buttons. This Italian characteristic keeps the torso looking shorter and the legs looking longer. Shoulders: Terry Corbett's suits are Neapolitan and have no padding in the shoulders, like the classic American or British, to maintain their natural slope and avoid a boxier look. The goal is to create a soft slope up the neck towards the head. Lapels: Terry Corbett's suits feature a higher gorge and a wider peak or notch lapel. Both are effective in creating a clean and simple look that can be worn to the office or on the weekend. They also offer great sight lines on the jacket that lead up towards the wearer’s neck. Jacket Length: The length of the Terry Corbett suit jacket is cut a bit shorter, unabashedly a Neapolitan style, to make the body look more proportional. It also lengthens the legs, which lead a viewer’s eyes up towards the body. Suppressed Waist: The Terry Corbett suit jacket is suppressed at the waist, a very Italian characteristic, giving the body more shape and an hourglass appeal. 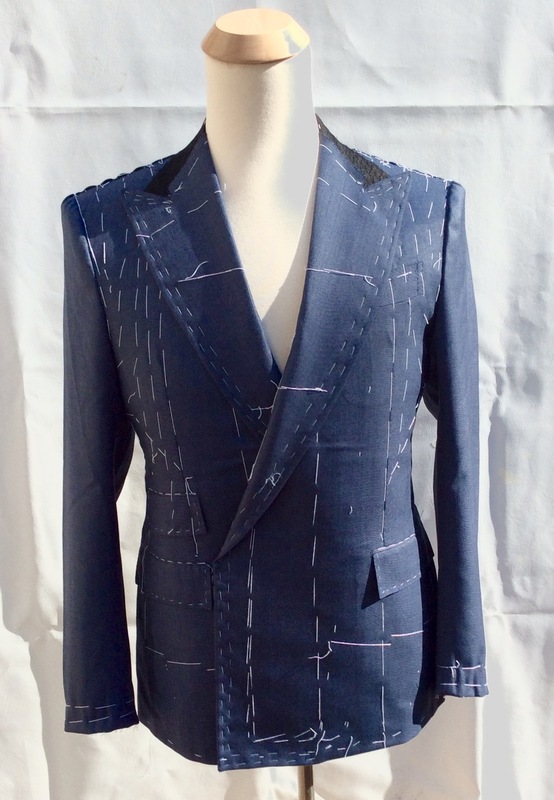 The goal is to make the jacket as tailored as possible to the man’s unique body shape. Double Vent: An Neapolitan tailoring element is the double vent of the Terry Corbett jacket, which was once beneficial for sports. The Terry Corbett suit uses this technique to make the cloth drape more elegantly, but like the true Neapolitan way, also because it is most practical for the wearer’s movement. Slim Trouser: Like the Terry Corbett suit jacket, the trouser is cut closer to the man’s body to create an elongated line that is tailored specifically to his shape. This also adds to the modern appeal of the Terry Corbett look, by eliminating the cuffed hems and inward pleats for a clean, slim fit. What is the difference between Bespoke and Sartorial? Bespoke suits are hand crafted using approximately 5000 individual stitches, that's approximately about 70 man hours of workmanship. The body of the suit is built up using a full canvas which is hand sewn into the cloth to create the correct shape. Bespoke suits are also hand cut and several fittings are usually given. Made to Measure suits are full canvas and are semi-hand made as opposed to our full handmade Bespoke suits. They are made in standardized sizes and are cut individually to your measurements from an adjusted pattern. These are wonderful suits. In fact, most of the time that you see me, I'm proudly wearing one. Sartorial discourse to ascertain your lifestyle and wardrobe requirements. Selecting the fabric and style. There are endless possibilities. Getting measured and discussing any anatomical abnormalities. Sending the fabric to our tailors, who make the garment to our precise specifications. We receive your basted garment in 3 weeks for your first fitting and then send the garment back to our maker for the making of your 2nd fitting. 8 to 10 weeks later your suit will arrive and then we will require a final fitting (your 2nd) at your home or office to make sure we're looking smart. Upon your approval we will deliver your completed suit in 8 to 10 weeks. All of our our garments, every customer's’ dimensions are saved on file and updated, as necessary, over time.